This is a remarkably simple crunchy salad that is filled with cancer fighting plant chemicals. Arugula is a zesty leafy vegetable in the cabbage family rich in sulforaphanes which promote normal detoxification function. Fennel is an aromatic vegetable rich in Vitamin C and a phytochemical called anethole which promotes normal inflammation function by blocking a damaging and cancer promoting cell factor called tumor necrosis factor. Fennel is a member of the parsley family is also rich in quercetin, limonene and beta-carotene. 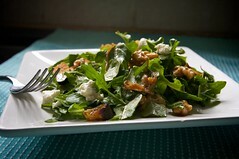 Tear the arugula leaves in to pieces and place in a large salad bowl. Thinly slice the entire fennel bulb into paper thin strips with a sharp paring knife. Add the chives and toss with dressing. This recipe is adapted from Nourishing Meals: Healthy Gluten Free Recipes for the Whole Family by Alissa Segersten and Tom Malterre, M.S., C.N.